When it comes to growing cannabis plants, there are many decisions to make and variables to consider. Will the grow be indoors or outdoors? If indoors, how will you set up your grow space? What soils and additives will you use? Selecting the lights you will use involves a whole separate litany of questions. With so many choices, one thing often gets overlooked and takes a backseat in importance: proper pot selection. There are some very important things to consider when selecting the right pots for your cannabis plants. Since outdoor grows often allow plants to grow straight from the earth, plant pots usually are a critical decision with indoor growers. The growing vessels to choose from vary tremendously in size, design, and construction material. Containers and pots for growing cannabis come in a wide variety of sizes. 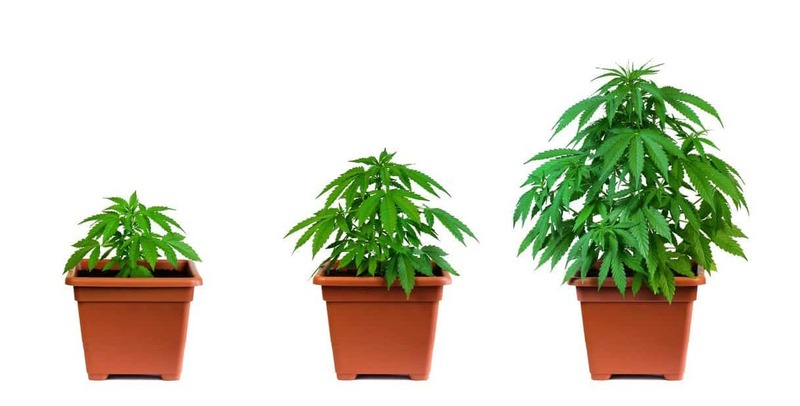 The size of pot you buy depends on how large you want your cannabis plants to grow. If a quick veg and flower cycle is your goal for a rapid harvest, the cannabis plants won’t grow very tall and will be fine in 2- or 3-gallon pots. For indoor grows with a small number of plants that will be able to take their time to grow large and produce a large yield, pit of several gallons on up to trash-can size will work well. A trash can won’t work because it lacks the holes near the bottom to ensure proper drainage. They also are more vertically oriented than you will want to optimize rapid and thorough root growth. Fortunately, you can follow any number of nursery charts to determine which size will be best for your needs. While some people choose to re-pot their plants often while they grow, this method is labor intensive, and the transplanting process tends to shock the plants each time they’re transplanted. A better, less labor-intensive, and shock-free method is to start your sprouted seed, seedling, or cutting in a relatively small pot (1 gallon) before transplanting it once to the pot it will occupy throughout its life. The idea behind the small container is that it allows close monitoring of soil moisture. In the early stages, you want your soil to be moist but never wet. At any stage of growth, wet, waterlogged soil containing stagnant water will lead to root rot and disease. Experienced growers may opt to begin with the container the plant will occupy throughout its life. The root system will appreciate plenty of room to spread out without hitting pot-well interiors and becoming root bound. Healthy roots equate to healthy cannabis plants, since roots absorb all the nutrients the plant needs to thrive. If started in a larger pot, closely monitoring the soil moisture (not too dry or wet) will ensure the plants thrive as they develop a sufficient root structure to grow rapidly. Containers and pots intended for plants are constructed out a variety of materials, including terracotta, coir (coconut husk), plastic, ceramic, metal, wood, concrete, and rubber. The most economical, sturdy, and damage-resistant of these would be rubber or coir. Rubber and plastic are probably the most widely used in nurseries and plants purchased for repotting. A rubber plant container of the appropriate size makes a lot for sense for cannabis use. Many containers will shatter or chip with rough handling, but rubber bounces back and keeps performing for multiple grows. Since nurseries rely on them so often, rubber pots almost always have adequate drainage and are able to retain moisture well. Many growers have their personal favorite when it comes to cultivating cannabis, and compelling arguments can be made for each container medium, but there is much to be said for rubber or durable plastic, and these are the materials used most often. Regardless of the material from which the pot is made, a good cannabis pot should have adequate drainage—usually in the form of holes or drainage ports along the bottom. The goal is to thoroughly moisten the soil and then eliminate the excess moisture for reasons already mentioned. Moisture—not pooling, stagnant wetness—is the desired end result. Using pots without drainage, such as plastic cups, bowls, or pottery, is asking for trouble—the grower is less able to accurately monitor soil moisture. A bowl that lacks any drainage can appear dry on the soil surface but may be soaked with standing water at the bottom, which is a very poor environment for healthy root development. Unless you have your indoor cannabis plants on a cement floor with drains, using saucers or trays will help capture drained water. It will also increase humidity in the grow space, which may be a good or bad thing depending on your relative humidity levels. If humidity is high, it’s best to discard excess water from the saucers or trays after it collects and pools. If humidity is low, it’s sometimes a good idea to let the water evaporate on its own, as long as it eventually does so. Trays work well for several pots in close proximity to one another. Arranging them in a row resting on a tray will allow water seepage from all pots to collect in the tray. Removing the tray to discard excess water is the best practice if it doesn’t evaporate over the course of a day. 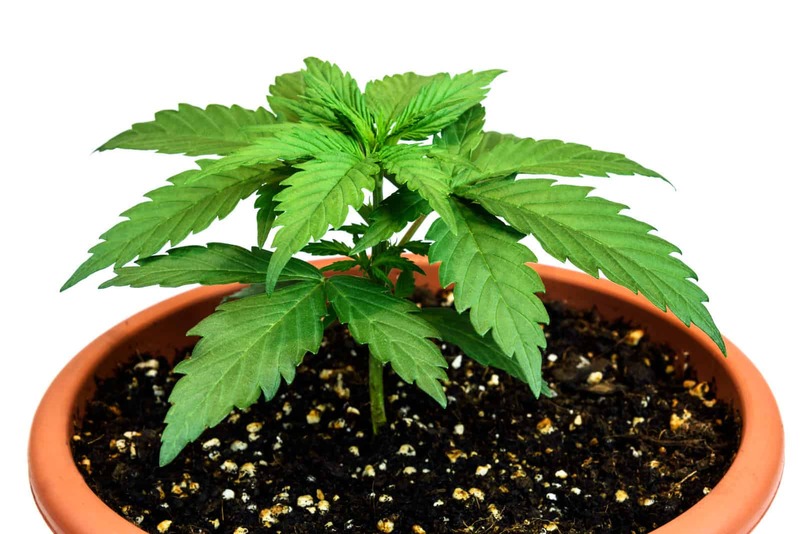 Growing cannabis plants in pots requires growing media. Straight potting soil is the simplest, most widely available choice. If you have access to compost, this is an excellent way to grow organically by adding it to soil for a nutrient-rich growing medium. A variety of pre-mixed soils with fertilizers already added are widely available as well. Some of these are organic, while others contain synthetic additives. The vast majority of cannabis growers prefer organic media. Other materials sometimes added to soil include sand, perlite, and coco fiber. These substances provide a less-dense soil mixture than straight soil. This type of mixture promotes rapid root development, which is always good for a cannabis plant’s overall health. Avoid soils that contain clay or other dense matter. They will clog root development and retain too much water, neither of which is good for cannabis. If you read cannabis industry business publications, you’ve most likely seen the advertisements for “air pots” and “smart pots.” These specialized pots can provide benefits for the ambitious cannabis cultivator. One of the main benefits of these types of pots is that they both provide increased oxygenation to plant root systems. Because these pots have so much exposure from the sides, the plants never get “root bound due to the pots’ unique “air pruning” from the sides. Because the soil or other growing medium dries out from the sides when using these pots, it’s difficult to overwater them. Extra healthy root systems are the end result when using them. Unfortunately, while smart pots and air pots provide some advantages over conventional pots, they also share the same shortcomings. Because of the dramatic increase in air exposure from the sides, these pots will require an increased amount of watering. Because of this, they will also require a decent-sized saucer to collect the excess water. This will be a minor inconvenience for some but not others. There is much to be said for the advantages these progressive pots provide. Regardless of which pots you choose for your cannabis cultivation, be sure to follow best practices and monitor your grow carefully. With attentive care, you can produce excellent flower with most pots. Use quality genetics, provide good care, and you will enjoy the rewards of your harvest on a relatively short amount of time!